In both marketing and retail, one size does not fit all. As a fashion retailer, sending impersonal content is a fast-track to annoying your customers and delivering a poor buying experience. It’s also a big part of the reason why the average person’s inbox contains 260 unopened emails – 56% of which are from brands. Considering that more than 75% of email revenue comes from campaigns triggered by subscribers’ actions, fashion retailers can’t afford not to take advantage of contextual marketing. Here’s how fashion retailers are using contextual email to deliver amazing experiences. Contextual marketing is all about getting the right content to the right people at the right time, and avoiding scenarios like the down jacket debacle above. For fashion retailers, contextual marketing is the best way to ensure you’re delivering the right products to the right people while strengthening your customer’s relationship with your brand along the way. Here are five ways fashion brands are taking advantage of contextual marketing. If you’re looking to send personalized emails, progressive polling is your ticket to gathering data from your subscribers in a fun, non-intrusive way. Here’s how it works: you send an email asking your subscribers’ preferences between two or more products. To vote, they simply click on the item of their choice. Then, based on the item they chose, you can send them a follow up email with a special offer on that item. Here’s an overview of what this type of campaign looks like. You can get creative with progressive polling by presenting one piece of clothing worn two ways and asking your subscribers about their favorite look. As a bonus, this method gives them ideas about how to use and style your offerings. 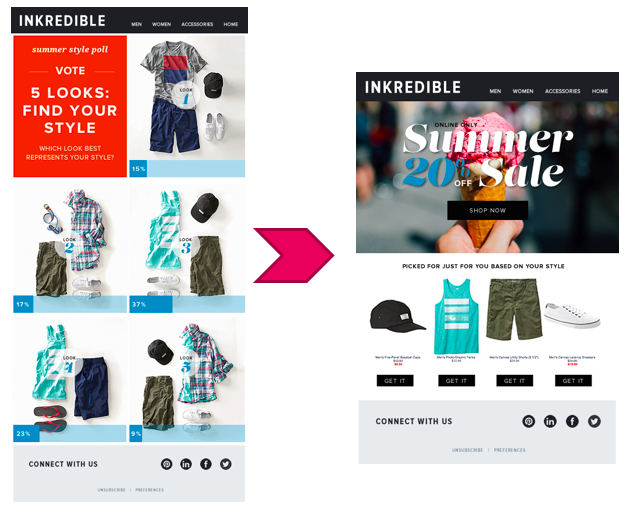 Personalized emails get 2.5x higher click-through rates and 6x more sales and there are lots of opportunities for fashion retailers to take advantage of them. Basic personalization involves using your subscriber’s name in your subject line and/or email content. But to create an even better experience, you can use the data you collected with progressive profiling to deliver emails based on the specific preferences of your subscribers. With advanced email personalization, you can send emails based on your subscriber’s location, local weather, past purchases and more. 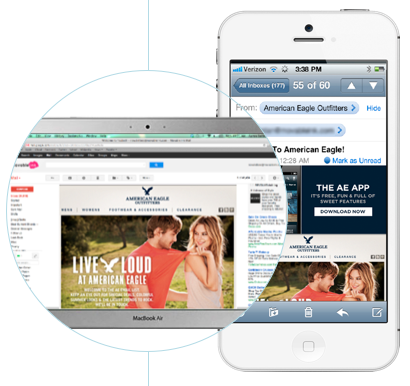 Learn more about basic and advanced email personalization. About 68% of online shoppers abandon their carts, which is why cart abandonment emails are a must-have for fashion retailers. They give your customers another chance to complete their purchase with you. If you want to give them an extra nudge, offer them a one-time discount on the item in their shopping cart or remind them about your free shipping. 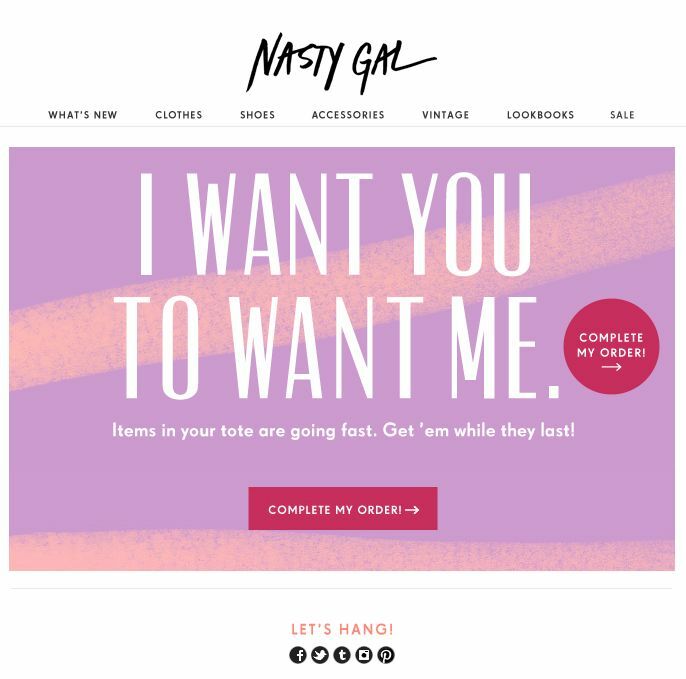 Another approach is to simply give people a heads up that your inventory goes fast, like Nasty Gal does. Have a mobile app that makes it even easier for your customers to shop? You can use device detection to automatically detect the device your subscriber is using to open your email and give them the appropriate link to download your app (the Google Play store or the iTunes store, for example). Device detection also provides a better all-around mobile experience, making your email content look amazing on any device. When a customer places an order, the first thing they want to know is when it’ll arrive. But order tracking isn’t always easy. Typically, your customers would have look up their order on a separate website every time they want an update. Imagine if you could include live order tracking right in your email, so every time your customer revisits the email, it refreshes with up-to-date shipping and tracking information. It’s not too good to be true, it’s just another way you can deliver awesome customer experiences with email. Here’s how Philosophy does it. Contextual marketing doesn’t just boost your retail sales – it helps you build lasting relationships and cultivate loyal customers. We’ve only brushed the surface of what contextual marketing can do for the retail industry – real-time A/B testing, live social feeds and live data can elevate your retail brand like few things can. This entry was posted in Email Marketing and tagged cart abandonment, fashion retail, live order tracking, personalization, progressive profiling on July 29, 2016 by Kristen Dunleavy.